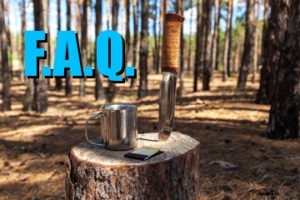 FAQ – Trail Blazer Survival School, Inc.
How large are the classes? - Our classes average from 4-8 students, but can have as many as 15 in our Essentials Course and 10 in our Applied and Advance course. Workshops average 10-15 students. What is your student to instructor ratio? - Our student to instructor ratio is about six students to every one instructor. We typically have at least two instructors at every course no matter how small the class is. Do you give out certificates with your courses? - We do give out certificates with each of our courses. We are extremely proud of our students, and want to recognize their hard work with a certificate and patch. Additional patches based on the level completed are available for purchase should you need more than one or a replacement. Where are the classes held? 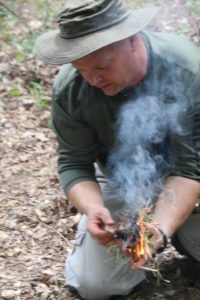 - We offer various workshops and adventures throughout Upstate South Carolina, but our standardized survival courses are held at our Survival Training Camp in Union, SC on private land inside the Sumter National Forest. Can I check out a class before I register for one? - Due to the disruptive nature of having drop-ins, we don't typically allow anyone to just sit in and check out a class. We do offer quarterly Meetup gatherings throughout the year for you to meet instructors, and sample some of our training. These are free events, and are open to everyone. What are your facilities like? - We have over 2o acres connected to the Sumter National Forest, a small lake, and many outdoor classrooms. We also have a Survival Shack that provides covered training during bad weathers and a emergency medical room (should it ever be needed)to use till EMS arrives. Does the cost include boarding? - Tent sites are available for all students at no additional charge. Local hotel accommodations are available at student's expense. Are there toilets and showers? - We have a drinking water station, hand washing station, and a porta potty on site. The Enoree river is close by for those interested in rinsing off. Should I bring a tent or hammock? - You may bring whatever portable sleep system that makes you comfortable. Tents and hammocks are preferred, but small campers are permitted with prior approval. We do also offer the option for students to stay in our primitive shelters when available to enhance your experience. Do I need to provide my own food and water? - You will need to provide your own food. Keep your meals quick and simple. Food may be brought, or purchased at one of the near by stores. (Walmart, Bi Lo, etc.) Water is provided, but we highly encourage you to carry a small water filter for your convenience. How hard is the training? What type of physical condition do I need to be In? - Most of our courses are very laid back and easy going suitable for people of all fitness levels. At times our courses can be rather strenuous, but we won’t push you beyond your limits. 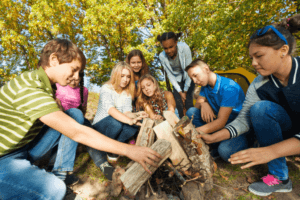 Survival camp is great for everyone. Are there any dangers that come with training in survival? - Like anything, there are some risk involved in survival training. Most dangers are a result of mechanical injury, twisting or lifting the wrong way, but are avoidable by being aware of your surroundings. Also, minor cuts are to be expected. First Aid kits are available at all times. In the summer there are snakes and spiders, but the ticks and chiggers are the biggest issue, so be prepared for bugs. Treat clothing with deet or permethrin. Natural bug repellents: Eat garlic / Mix 30 drops of basil or eucalyptus oil with water in a squirt bottle. If you have any questions about our Survival School or training, don’t hesitate to Contact Us. We'd be happy to answer any questions you may have.